PASO ROBLES (CA) – The California Mid-State Fair received multiple Awards of Excellence in the Competitive Exhibits contest at the 127th annual International Association of Fairs and Expositions (IAFE) convention. The awards were presented on November 28, 2017. The Fair took home 1st place awards for two Exhibits categories, “Create It on the Spot” and “Activity to Increase Awareness Of Competitive Exhibits”. “Activity to Increase Awareness Of Competitive Exhibits” – Our Kids Arts Smart program was put on by Studios on the Park of Paso Robles. 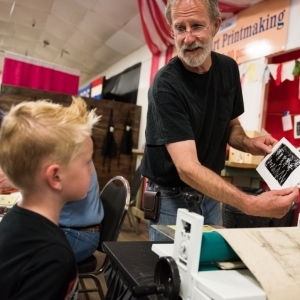 With the help of over 90 volunteers, Fairgoers of all ages learned to do printmaking for free and, at the conclusion of the daily hands-on activities, took home their masterpieces. The California Mid-State Fair also won eight 2nd place awards and seven 3rd place awards. “The IAFE Competitive Exhibits Contest provides fairs with a unique collaboration experience, allowing them to critique competitive exhibits while strengthening that vital aspect of fairs, internationally,” Lori Hart, Director of Education and Member Services, said. The International Association of Fairs and Expositions (IAFE), based in Springfield, Mo., is a voluntary, nonprofit corporation, serving state, provincial, regional, and county agricultural fairs, shows, exhibitions, and expositions. Its associate members include state and provincial associations of fairs, non-agricultural expositions and festivals, associations, corporations, and individuals engaged in providing products and services to its members, all of whom are interested in the improvement of fairs, shows, expositions, and allied fields. For more information, visit www.fairsandexpos.com, follow the IAFE on Facebook, Twitter, Instagram and Snapchat, or call 800-516-0313.